Regency at The Woods of South Barrington is an exquisite active adult community in South Barrington, Illinois. While part of the master-planned neighborhood of The Woods of South Barrington, the Regency enclave is an exclusive 55 and over section in a private, gated setting. The Regency also has its own clubhouse and an activities director, separate from the all-ages portion of The Woods of South Barrington. Regency at The Woods of South Barrington is a collection of 156 finely appointed single-family homes that feature the most luxurious upgrades. Buyers can choose from pre-owned resale homes. The whole community is tucked away in nature, but only minutes away from medical services and entertainment. The closest retail and dining establishments are within walking distance at the brand new Arboretum shopping center. Regency at The Woods of South Barrington has a resort-style clubhouse that reflects the community's elegance. Here, residents can work out in style at the fitness center with an aerobics studio, or get a less formal workout by playing tennis. Additional activities include bocce ball, shuffleboard, and a putting green. Home owners also enjoy lounging by the heated outdoor pool as well as taking scenic walks around the neighborhood and into the South Barrington Conservancy. An activities director oversees daily lifestyle activities and planned events in Regency at The Woods of South Barrington. Some of the activities take place at the clubhouse multi-purpose room, which is also open for individual hobbyists as well as arts and craft related group meetings. Construction of the luxurious ranch homes in Regency at The Woods of South Barrington began in 2005. Home buyers can choose from seven exquisite ranch-style models that provide from 2,100 to 2,600 square feet (plus bonus space) of living space. In addition, there are five exterior choices for each floor plan. The exteriors available include facades with intricate brick and stonework. Inside, each home at the Regency is appointed with high-end features. These include granite counter tops, hardwood floors, stainless steel appliances, 8' two-panel interior doors, upgraded trim, crown molding, and concrete driveways. The floor plans available offer two to three bedrooms and two to two-and-a-half baths. Some plans also feature a den for additional space. The monthly association dues are the same for each model and are quite reasonable for a community of this magnitude. Regency at The Woods of South Barrington sets a new standard for active adult living and is a perfect oasis for those who want the best life has to offer. Newcomers will surely be proud to call this distinguished community their home where convenience and privacy meet. In addition to the on-site clubhouse, residents also have use of the amenities at The Woods. A lifestyle director, solely dedicated to this 55 and better neighborhood, oversees all events and provides a balanced roster of social events and activities. Ideally located near Route 72 and Route 59 in prestigious South Barrington, Regency at The Woods is just down the street from the Arboretum Shopping Complex. The center features lots of shops, fine restaurants, an upscale bowling alley, and hair salons. Downtown Barrington and the surrounding suburbs are also full of additional restaurants, national retailers, and boutiques. Regency at The Woods of South Barrington is also only minutes away from medical practices, world-class hospitals, and churches. It is only two minutes to the Northwest Toll Way which leads to the Woodfield Mall in Schaumburg, O'Hare Airport, and downtown Chicago. In addition, other major expressways and Metra stations make it easy to explore the surrounding areas and also make for convenient access to downtown Chicago. There are plenty of activities available in Regency at The Woods of South Barrington. Here is a sample of some of the clubs, activities and classes offered here. The single-family homes in Regency at The Woods of South Barrington are some of the most luxurious homes offered at any active adult community in the Chicagoland area. These spacious homes include opulent included features such as granite countertops, upgraded cabinets, flooring and appliances. Many of the homes feature upscale brick or stone facades with side-load 2-car garages. Included basements and optional second story lofts make for even more space. This was the best decision we ever made. We looked at several communities and many builders before we made "the last move of our lives". Toll Brothers is a quality builder that exceeded our expectations. Everyone from the sales team to the design team, to the on site management worked with us on a daily basis to make sure everything was done to our satisfaction. We made the right choice and there is nothing we would have changed. Great neighbors, great community, a wonderful place to stay young forever. We thought about downsizing and moving to a 55+ community for four years and once we decided to take the plunge we have not had one regret since. We only wish now that we had done it sooner. We have make so many new friendships and are involved in many activities. We love being so close the the Arboretum and all that it has to offer. Being so close to 290 and the easy access to get anywhere makes it even more desirable. We wanted to live nearer to our offices. Regency has easy access to the main roads allowing for the shortest commute in our marriage. We wanted to downsize not downgrade. Regency had a floor plan that worked with our empty nest lifestyle. We wanted to be close to shops & restaurants. The Arboretum is fantastic! We wanted to make new friends & socialize more. Our neighbors at the Regency have been so welcoming & fun-loving! We've managed to tick all our boxes in one location. The Regency is our new home. My husband and I wanted to move, but didn't think we wanted an over 55 community. We thought we were too "young" for anything like that. We started looking, and realized that if we wanted a ranch single family home and maintenance free living, an over 55 community was the best choice. We looked at a few in the area, but Regency had the best location for us, and we loved the look and feel of the community. We visited the sales office and walked the community several times before making the decision to buy. The sales people were wonderful to work with and very accommodating. We have lived here for almost three years, and we are very happy we made the decision. We love our home and the fact that we can walk to the Arboretum for shopping and restaurants, but most of all we love the people who live here! When we decided to move to Illinois from out-of-state we were looking for a house. What we found at the Regency at the Woods of South Barrington was a community as well. While we initially thought that such things as a clubhouse, pool and on-site social director were just additional expenses, these amenities soon became an important part of our new retirement lifestyle. We got involved with Regency events and activities both as participants and organizers and that has helped ease our move from our previous home now 900 miles away. We are very comfortable in our home. We have a look-out basement that works well for us. We were able to build a sunroom on our elevated deck and the basement with its windows is great for hobbies and entertaining. Like I said to my neighbors in one of the restaurants in the Arboretum shopping center (within walking distance of the Regency) at the Social Committee sponsored Happy Hour Get Together last night, it sure is nice to live in a place where new friends and acquaintances are easy to come by! We've lived in our Regency home for two years. The construction process was explained thoroughly and there were no surprises. We have only lived in the Regency community since August, but are pleased with our life style chance. It sure is an active community with chariable as well as social activities. People are very friendly and helpful. We seem to look out for each other. Toll Brothers has an open door policy at the sales office. Any concern or question they are most helpful. Make the move to the Regency and join a caring community. We have lived in the Regency for over 5 years. We have watched it develop over a number of years prior to our buying and moving in. I was not to sure about moving into an over 55 community. I was indeed ready and have not regretted the move. The neighbors are special and look out for you when you are away. We have an active social program that gets everybody together in the clubhouse. Our location is ideal, within walking distance to a number of quality restaurants and shopping. Also, attractive is our location to I-90 which connects us to the city, airport and north south highways. The house itself is just the right size for us and is well insulated and modern. Overall the community and accommodations make the Regency the ideal place to live. We have lived here a little over three years and love pretty much everything about The Regency, our home, neighborhood conveniences, community amenities and very welcoming and friendly neighbors. We had high expectations moving in and those expectations have been exceeded. My wife and I never EVER thought we'd live in an active adult community. As we neared retirement age, we carefully researched town homes and condos in the Chicagoland metro area, never even considering that retirement could continue in a single family home. We wanted someone else to mow the lawn and plow the snow. We even put a deposit on a town home in another suburb of Chicago. But . . . we finally realized that shared walls were not our 'thing', and we still wanted the option of gardening and some 'outside' space of our own. Then, a miracle occurred! My wife and I stumbled upon Regency at the Woods of South Barrington and immediately fell in love with it. And the more we learned, the more in love we became. It's now been a short few months since we moved in, and I have to say, it's even better than we thought. We knew the walkable shopping and restaurants were there (with great Happy Hours), but the camaraderie (with both the other residents and members of the Toll Brothers team), budding friendships and long list of things to do were way more than we ever could have imagined. My wife and I have a beautiful house, a warm home, and even more important, a new life. Come join us! We casually stopped in the sales office on a beautiful fall day. After a very courteous and informative talk with the sales person we walked the neighborhood. It was amazing to us how we both had the "this is it" feeling. We had been looking for a few years throughout the Chicagoland area for a place that would offer an active social lifestyle. There are many choices within the community to get involved in social and charitable activities. In addition the community is within walking distance to many shops, restaurants and entertainment venues. Once we made the decision to build in Regency, Toll Brothers accommodated our requests and kept us involved every step of the way. Once the sale was complete and closing done it is not the end of the relationship with Toll. The sales office door is always open for a friendly conversation. Any construction issues are taken of in a timely manner by the construction office. We are very pleased with our decision and happy with our new lifestyle. It is a welcoming community and in a short period of time we have made great friends. We moved into Regency at the Woods of South Barrington a little over a year ago and are very happy with our decision. We had been looking at condos in suburban downtown areas as well as other homes, either new construction or previously owned homes, and were just not seeing anything that was appealing to us. We are delighted with the quality of the home that Toll Brothers built and with everyone we dealt along the way. They were always helpful, professional, and patient. The sales people have stayed connected with the community and are very friendly and supportive. The community itself is just the right size. The homeowners are engaged and welcoming and yet very independent. Since we are both still working and have large extended families, the location was very important to us. We feel we are far enough removed to enjoy the open feeling of the area and yet still close enough to feel connected. The clubhouse with the pool and fitness center is great and the walking paths are just beautiful. There is great shopping and restaurants nearby, so we never feel out of touch. We could not be more pleased with how this move has turned out for us! We were one of the early homeowners to move to the Regency at the Woods of South Barrington. Prior to moving, we researched several new development sites and compared what was offered against our new home selection criteria. Our criteria covered several factors that we felt were important for us in our retirement years. Those factors were proximity to our children, reputation of builder, quality of product, varied floor plans, accessibility to events, and value appreciation. Living within a reasonable distance from our children and grandchildren was very important to us and this factored heavily in our location choice. 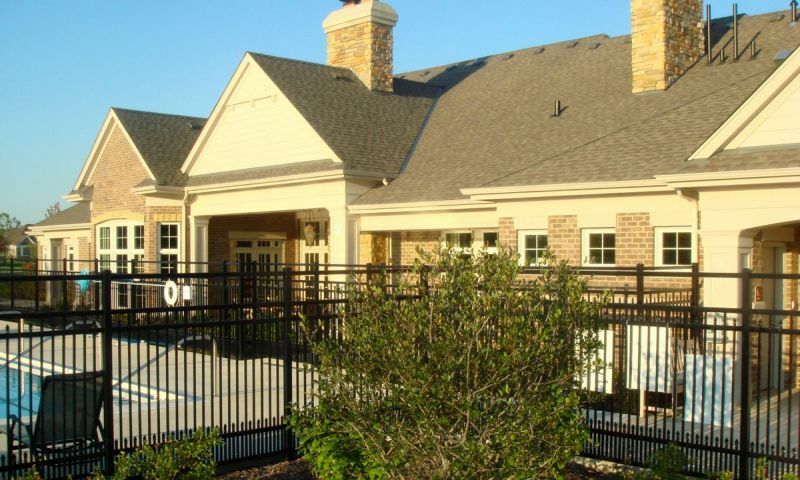 When we first heard about Toll Brothers developing an Active Adult community in South Barrington, we researched all we could about the development. Toll Brothers of course has a long history of building quality homes and the elevation, floor plan and general amenities were what we wanted. Other deciding factors was the accessibility to Interstate 90 to get downtown in 40 minutes (non-rush hour), shopping at the Arboretum and Woodfield, and proximity to many suburban cultural and entertainment venues. Given this economy, we are also seeing that our property value is holding well for the area as we anticipated. Although we already had a busy and varied social life, we have been delighted to find that one of the unexpected pleasures of living at the Regency is the many new friendships we have developed. There is a sense of family here, where everyone keeps an eye out for their friends and neighbors and a dedication to including new home owners into our activities and social circles. All in all, we are very pleased with our decision to live at the Regency. 55places.com is not affiliated with the developer(s) or homeowners association of Regency at The Woods of South Barrington. The information you submit is distributed to a 55places.com Partner Agent, who is a licensed real estate agent. The information regarding Regency at The Woods of South Barrington has not been verified or approved by the developer or homeowners association. Please verify all information prior to purchasing. 55places.com is not responsible for any errors regarding the information displayed on this website.